Undermatching: Half of the smartest kids from low-income households don’t apply to selective colleges. How an information mismatch is costing America’s best colleges 20,000 low-income students every year. Each year, middle-class American high-school seniors with good grades go through a familiar ritual of the college application process. They file a bunch of applications—perhaps after visiting several schools—submitting test scores, grades, essays, and letters of recommendation. They apply to a “reach” school or two and a “safety” school or two along with some in the middle. The idea is to see where you can get in and then decide where you want to go after researching both the quality of the schools on offer and the actual financial cost of attending. It’s a system that’s a bit stressful and annoying, but it basically works. Students get matched with schools that roughly suit their level of academic preparation and people have a chance to shop around a bit for the myriad forms of financial aid that make college attendance feasible. But it doesn’t work for poor kids. It turns out that over and above all the other disadvantages one faces growing up poor in America, the majority of high-achieving kids from low-income backgrounds fail to apply to any selective colleges. This grim discovery comes from Caroline Hoxby of Stanford’s economics department and Christopher Avery from Harvard’s Kennedy School of Government. It adds to our understanding of structural inequality in America and the striking barriers to social mobility. But in a sense it’s an optimistic story, suggesting that there continues to be plenty of low-hanging fruit in American education. Relatively simple reforms could unlock a great deal of currently wasted talent, with big payoffs for poor kids and society at large. Most high-achieving students—defined as those with SAT or ACT scores in the top 10 percent—come from high-income families. Thirty-four percent are from the top quartile, and 27 percent are in the next quartile. Just 17 percent of high-achieving students are from families estimated to be in the bottom quartile of the income distribution. But while low-income students are underrepresented among high achievers, 17 percent is still a lot of people—something like 25,000 to 35,000 per year. Of those, about 70 percent are white, 15 percent Asian, and 15 percent black or Hispanic. High-income, high-achieving students generally do what you’d expect. Most of their applications are to schools where the median admissions test score is similar to what they got. But they apply to some reach schools and most to a safety school. Generally they apply to the local flagship state university campus, which is sometimes a match and sometimes a reach depending on the state. The mismatch, in other words, is double-sided. 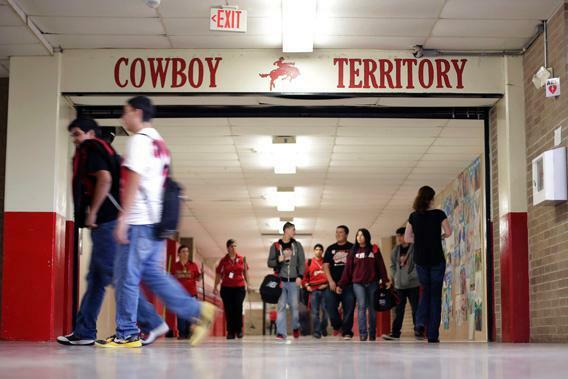 Selective schools looking to recruit low-income students with strong test scores are looking at a few hot spots with unusually high densities of such kids and ignoring the long tail of smart kids in smaller cities, in rural areas, and outside magnet programs. Selective schools also seem disproportionately focused on their own areas, such that a small city that’s near highly selective colleges (Providence, R.I., or even Portland, Maine) sends more kids to selective schools than a much larger city such as Atlanta, Miami, or Phoenix. Meanwhile many low-income students simply don’t encounter teachers or other school personnel who’d be in a position to inform them about available financial aid and encourage them to apply to more selective institutions. There are some logistical barriers to improving recruiting—it’s cheaper to recruit nearby and in bigger high schools—but they hardly seem insurmountable. If colleges start to realize how many high-achieving low-income students they’re missing, they might send their recruiting staff further afield. What’s more, written communications can easily target students regardless of location. The key is that written outreach needs to be specially tailored to the circumstances of low-income students whose personal networks don’t include graduates of selective schools. That means emphasizing the real cost of attendance rather than headline tuition, and the fact that there are gradations of school quality beyond Harvard vs. Other. And success could build on itself. If selective schools did a better job of reaching out to lower-income students, they’d build more diverse alumni networks. State governments (or Washington, D.C.) could also play a role, committing to targeting top-performing students in low-income districts. Either way, compared with the other dilemmas involved in improving the education system, tackling undermatching seems relatively straightforward. The main barrier is that most people have no idea how widespread it is. Each year, 10,000 or 20,000 of America’s brightest high-school graduates don’t go to a great college not because they can’t afford one but because they don’t realize they should apply.